With the title Stone Collection, I like to refer to a very simple gesture, a natural reflex that we had in childhood and even later to collect found stones while longing a path. The quality of choosing is very personal, intuitive. Here the idea is the same, just with a different scale and presenting a found object in the idea of an objet trouvé. As in previous works, I’m not interested in inventing something new but rather pointing on the existing, bring it to the foreground and create a visual composition. For me the presence of a scholar rock, as it traditionally did in a scholar’s room referring to nature and inspiring the creation, also confronts us (physically) to the question of scale. Scale not only in terms of dimension and weight but also in terms of time. These stones which have been washed and shaped (often by the stream of a river) during hundreds, thousands of years relativize our existence and brings a new perspective to the lapse of time that we have. In another work Red Ladder (The Scale) I present the same concern but with a certain smile. This laboriously forged object (sculpture) is less important for its material existence, but rather a (jokingly) link to its title and theme about scale. A kind of French word play: c’est une question d’échelle, it’s a question of scale (échelle means ladder but also scale). A reflexion I developed in different ways these last years. The way to present these stones (and my work in general) is important for me. Here trying to create a meditative composition, a space for quiet contemplation and at the same time adding a “painterly” quality, renouncing any ornamentation but create a minimal background for each stone. The choice of color is carefully selected to vanish the obsolete, the “dust” and give a personal and playful note to this tradition that I appropriate into my work. I want to evoke the meditative moments through these works. My cultural background has to do with that interest and affinity in silence, but it is also a personal need. Already in 2003, I worked with our condition to be exposed to noise, speed, and stress. Being overwhelmed by information and impressions, the noise from outside but also noise inside us, provoked by our thoughts, restlessness, and agitation seriously affecting our life. That was also the reason I decided to create the “radical silence” for my solo exhibition “Air Conditioned” in the Luxembourg Pavilion at the 50th Venice Biennale. Natural materials are also important in my creations. At the one hand, I like to work with natural elements for their visual and haptic quality. For example, in the series of “Moons”, I used marble as paint attracted by its deep and precious texture. At the same time, the use of marble has to do with my time in Rome, its unconscious influence on me but also its historical reference in Roman art. 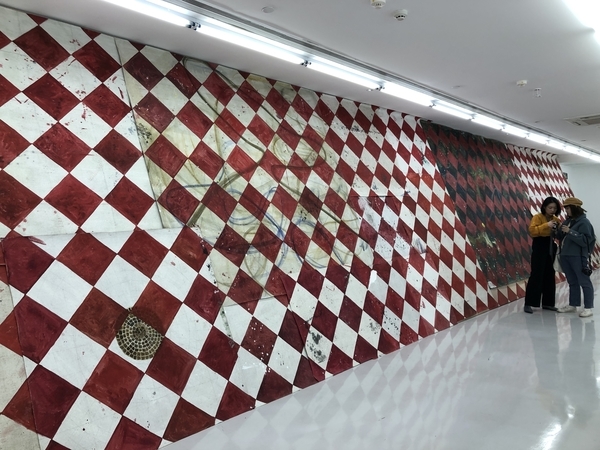 Then there is this red resin, in opposition to create a tension between marble and the strong red color treated in relation to the Japanese tradition of lacquer ware. So in a second reading, there’s a tension underneath the work between two countries and two cultures. This kind of tension relating to nature also embedded in the work Trees and Roots. I started it with a series of photographs of “everyday” moments of these trees with their wrapped roots waiting to be planted before adopting their new environment, the ground, being “rooted” again. I was touched by the fragility (and force) of this “exposed” situation, the beauty of the wrapped roots and the idea (and image) of the growing roots, “taking” the ground and gradually anchor themselves. Later I developed that image into bronze sculptures, working with the scale and space. Beside being inspired by nature and natural elements, I’m interested in the nature of the human being, the physical body and, especially, his spiritual soul. Through my work, I try to get closer to our intuition, to the essence of humankind and reflect to our existence in time and on earth. My works often refer to words, language, literature, and books. So that people can see the paragraphs on the wall for corresponding works presented in Yuz Museum. 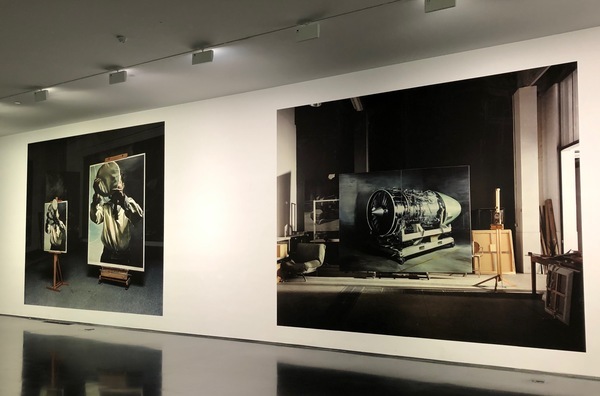 During the preparations of the exhibition (the first venue of the touring show was in Luxembourg at the Mudam) I exchanged a lot with Christophe Gallois, the curator who has not only a sensitive reading and understanding of my work but also a deep and rich body of references. This vivid exchange has led to these “notes”, giving like a second layer of meaning. Besides of this, music also plays equivalent role in my creation. I think the most important for an artist is to use a personal language, to express ideas in the most honest way. As I grew up in a musical family, for me, music and sound are the “tools” to use to create images or to get inspiration from and express myself with that language I feel familiar with. “Nested” is my first solo show in China, which composes interesting dynamics beneath the exhibition. The influence of oriental culture keeps floating in my works for last years. When I visited China (my family is in Hong Kong, to be precise) as a small child, I was fascinated by the landscape and the contrasts between the modern (contemporary) architecture and the tropical natural environment. The loud, busy and “wild” crowds, the smells on the markets and the excitement in the Cantonese language. When I visit China now, I can not speak of a “real” China still being a foreigner feeling that “wildness” in a way, but at the same time feeling very familiar, close the way of feeling, eating and perceiving. Maybe it remains in my works in some way. Liquid Health is a fictional cultural and creative company established by Li Hanwei, which exploits Chinese culture to conduct brand development, thereby creating a cultural brand that is designed to cultivate the body-mind-soul-spirit of human beings. On 13 January 2019, the exhibition entitled by the brand’s name “Liquid Health” will open in the context of the Goethe Open Space at the Department of Culture and Education of the German Consulate General. The entire office space will be transformed into a private lounge of the brand, and also the latest product series of Spiritual Beauty Instrument will be launched on that day. Beauty mask instruments, eyes massagers and face lifting instruments ….. All these provincial TV products stem from advertisements the artist watched as a child. These ads usually arise from very spontaneous and shallow thoughts, and end up with shoddy produced “landscapes”. They also form the narrow core of “Chinese Dream, Blue Dream”. Together with the artificially high GDP and the overwhelming promotion of a great nation image their advertisers share a common enemy, and these circumstances form a strong contrast to the “American dream” that once tempted many people of the world. 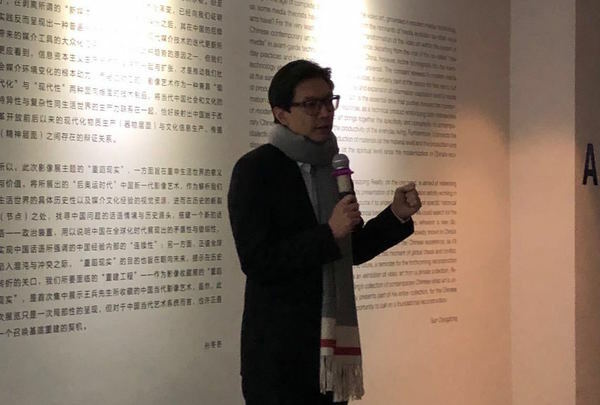 Ultimately, this exhibition may be seen as a confrontation between “Socialism with Chinese characteristics” and “American Imperialism.” Li Hanwei chose to stand on a side more related to himself. This means that he does not observe these Chinese phenomena with a Western gaze, but rather adopts abundant local resources in his artistic work. 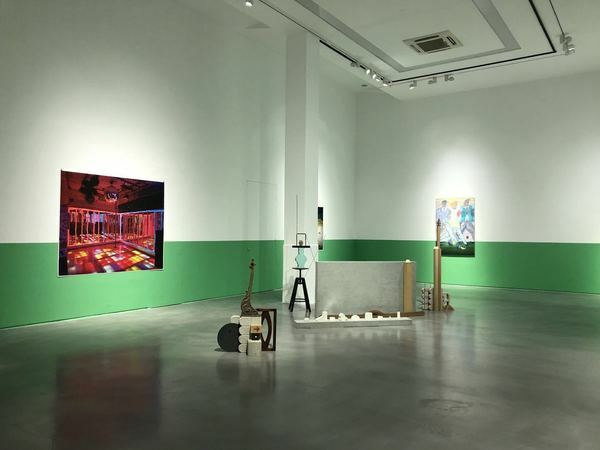 By so doing, he emphasizes more the cultural landscape in China’s special environment than just focusing on issues of pan-capitalism (like most post-internet art do). If you would like to experience these cultural landscapes, just visit the Cross Tower at No. 318 Fuzhou Road in downtown Shanghai. Enter the lobby of this office building through the revolving door, and turn right into the “Liquid Health” high-grade private club. The first thing jumping into your sight will be the reception desk and the money drawing feng shui pool, which appear at the same time as our glittering brand logo. You can choose to stroll around, or lie on a comfortable lounge chair to watch the brand’s promotional videos. All this creates the cultural ambience for our brand. Three brand new spiritual beauty instruments, as this time’s blockbuster products released by Liquid Health, will provide unprecedented spiritual sublimation for customers by means of Chinese culture. Here, as a product, culture becomes purer and pleasing. The cultural impoverishment caused by the landscape will be compensated by a landscape correspondently. The healthy liquid, is the “zen” of lifestyle, “be water” encouraged by Bruce Lee, a cultural form that is floating and flexible, and it is also an anonymous thing, which is omnipresent, wrapping and pervading you. She holds a Bachelor of Arts from the Department of Art History of China Academy of Art and received her Master of Arts degree from Lancaster University in the United Kingdom. She is now a PHD candidate of Western Philosophy at Eastern China Normal University. Jenny’s translation on academic papers, interviews, and critical reviews have been widely published. 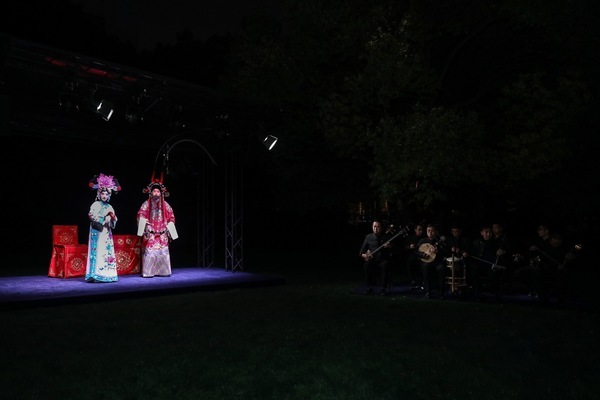 In 2018, She participated in the first edition of the Shanghai Curators Lab led by Carolyn Christov-Bakargiev. She has also been shortlisted for the “Emerging Curators Project 2018” hosted by PSA, and curated the exhibition “Remote Sensing” in Slime Engine Virtual Space, as well as “Hunting Cycle” in MadeIn Park in Shanghai, China. Jenny’s other academic activities and curatorial projects include the First Annual Conference of Network Society “Forces of Reticulation” roundtable, Huayu Forum of Art, the exhibition “Information Sculpture Highway” at MadeIn Gallery, “Pixel Park” at Jingan Sculpture Park, etc. Her article Post-Internet Art Inside and Outside the Chinternet was included in the collection of essays Forces of Reticulation published by China Academy of Art Press. Jenny CHEN Jiaying Blog at WordPress.com.